Your letter and the accompanying signatures of over 6,000 citizens of the Detroit area indicating support for the efforts of our armed forces in Vietnam are reassuring and deeply appreciated. I have forwarded them to the Command Information Officer for dissemination of this remarkable expression of public appreciation to our troops via our military newspaper. On behalf of all the servicemen in this command, I extend my heartfelt thanks to you and the people who contributed to this overwhelming display of support. Your 7 May letter describing the parade held in Detroit on 30 April is deeply appreciated. The many meetings, parades, and other community activities expressing support of our armed forces in Vietnam have done much to convey encouragement to our troops. Your efforts to sustain the morale of our men here on the frontline of democracy are indeed reassuring. 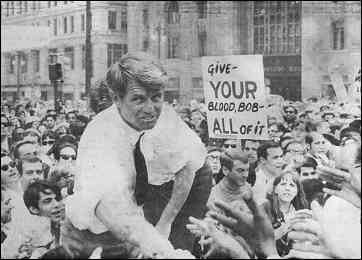 The scene below was at Kennedy Square on May 15th when Sen. Robert Kennedy visited Detroit.